Mobile Matinee: Phone or Tablet- It’s a Galaxy Note! Phone or Tablet- It’s a Galaxy Note! Before discussing about the new Samsung Galaxy Note, let us know what “Note” is? A Note is a new type of smartphone, which is both a phone and tablet. The note is the result of insight and innovation. The desire of people for a device featuring computer like specifications with voice calling feature insisted Samsung to launch Samsung Galaxy Note – 5.3” screen and voice calling feature. 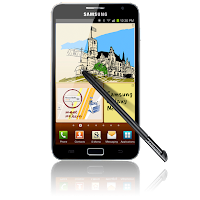 Galaxy note is the ultimate on-the-go device. It consolidates the features of tablet and mobile phone in one pack. Tough, Dell’s Streak is already in the market; it has not a big successful device. 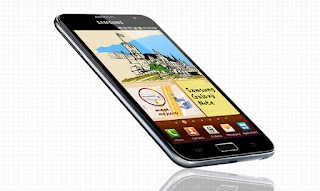 But Galaxy Note is expecting to create buzz and hold the smartphone market. Samsung Galaxy Note is truly smart. It empowers you with everything that you ever desire from your handheld device. What is special about the Galaxy Note? Samsung Galaxy Note’ killing look! The 9.65mm thick Galaxy Note is ahead in the Zero Size figure race. This pocket friendly device is in the wish list of every geek. It seems that the device has extensively participated in body building activities. Its toned build quality makes it appear very graceful. It looks fantastically vibrant and sharp. To add to the look, the device is powered with HD Super AMOLED display making everything looks great on the device. The deivice is available at Saholic.Com. T. Simple theme. Theme images by 5ugarless. Powered by Blogger.